My new neighbor to replace Pierce is Maple! I’ve had her before in a previous town, she’s really nice. 🙂 I was expecting a normal villager to move in since I didn’t have any at the time. She looks like a “new” Maple, so hopefully this is a good sign that (other than Pierce) my slots were clear! The first thing I see when I step through her gate is my favorite constellation, 13th Zodiac! 😀 Then Rain came out of the gate right behind me. Two flower girls in a field of dandelions. 😛 I usually run over individual dandelions (she said runs over them, too, which must be especially pretty with all of them in one place, and petals flying all over the place!) that pop up because I thought they were weeds. It looks like they aren’t, though, because Bundeena is a perfect town. Mathilda’s house is so nice. 🙂 I love this house style and shape! 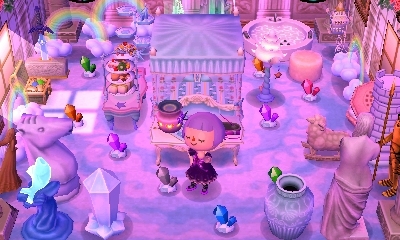 This is my favorite spot in her town! 😀 I think it has a romantic, fairytale feel with the single gold rose. Yay, I was happy to see she made use of the lullaboids I gave her on our first wi-fi meeting! I just think they look lovely in white rooms and their sounds go so well with a music box. I also love her new wallpaper! The first thing I noticed when I walked into this room was her self-made butterfly shirt! 😯 It’s so perfect for her vibrant mush room. ^_^ She said she used a square picture of the real Gracie shirt as a guide for making her own version, which I call smart, not cheating! 😛 (I’ve actually thought about doing that myself before. :P) I have the official guidebook for Wild World — never use it anymore, it’s not that great — but one cool thing about it is that it has square views of all clothes, carpet, and wallpaper. There are scans of these in sunmarsh’s guide on ACC. Aww, it’s the garden where Pierce used to live. I hope he moves back in the same spot! I’ve disappeared. xD I don’t have any really dense orchards like this in my town; it looks like it was hard work. Rain looks so cute asleep amongst the flowers! The last things we had time to do after exploring her town were visiting Anabelle and Cyrano. My first thought was that Teru doesn’t have any characters that look like me, but I guess human characters probably all look similar to him. 😛 He must be referring to Sidney. I arrive back in Dafdilly and there’s already a letter from Cyrano! No present, though; I wonder why sometimes there is one and sometimes there isn’t. I completely forgot about the bug-off today, so it’s good I happened to be playing at the time. I forgot about all the previous bug-offs, too, so this is my first one. I have no idea how this happened… I don’t really like Curly, so I don’t talk to him much and I’ve never done an errand for him or sent him a letter. Lobo was in the lead until I caught this birdwing butterfly, which set a new record. I’m not sure if I won or not, though; someone could’ve caught a larger birdwing later. This is the new side path I’ve been working on, just plain bricks. I’ve only completed this bit on my island (connecting the two bridges), though. 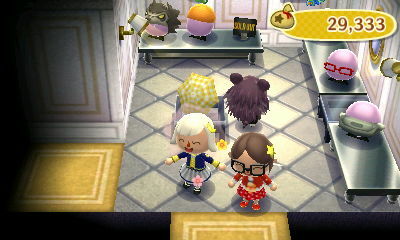 Posted on September 18, 2011 by Amy •	This entry was posted in AC:WW, AC:WW WiFi, Dafdilly and tagged Animal Crossing. Bookmark the permalink. I’ll try to post the 2nd Episode,because i’m keeping the 1st Episode hidden for awhile.. wait.. that means!! WOO-HOO! We can wi-fi so i can give you my Apply TV & Lovely Phone and the Cabin Chair too of course 😉 BUT… If the Delivery comes early i *could* give you that! but for the time being please wait,alert me if Baabara’s Moving but please!! NOT IN MY CAMPING DAYS!! >_< Oh,I hope! I LOVE the new side paths that you made! >_< I'm actually jealous! I see that your doing a pattern page but for an awesome Pattern Maker like you? Thanks, I’m glad you like it! Here are some instructions I threw together real quick! They’re basically mirror images of each other. As for the pattern page (and guides, too :P), they’re currently privately published and I’m still working on them. I just don’t want to have too many under construction pages (like my Trildale one :lol:). Aww thank you! I think you’re a great pattern maker! 😀 As for me, I don’t think I’m naturally that good at drawing or making patterns, but I enjoy challenging myself with them. Btw, here is what I meant when I said ripped sprites. As you can see, being on the computer you get the clothing designs pixel for pixel, so it doesn’t take much brainwork to copy it onto your canvas after you enlarge the image so you can see better. 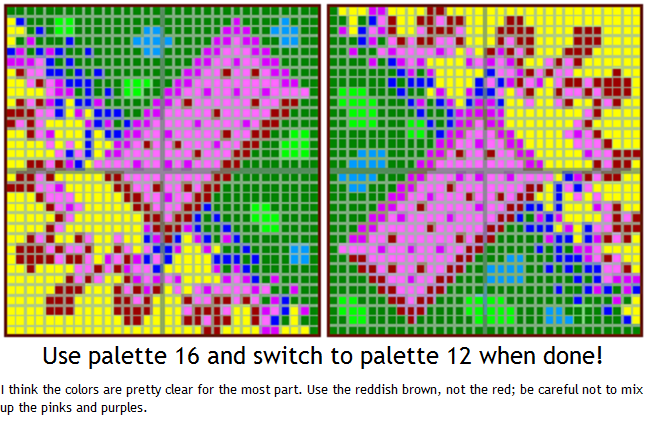 Lots of the palettes don’t seem to match, though. I especially wasn’t sure about whether or not clovers were weeds, but I think it makes since that dandelions aren’t considered weeds since you can pick them up and wear them as accessories and all. That..is..amazing! 😯 Wow, thank you so much for that link! 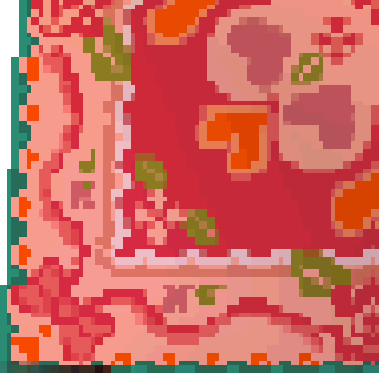 I try to make my own icons using screenshots from an emulator, but there’s no good way to view a square image of clothing patterns, carpets, and wallpaper. I think the only way you can do it for clothes is when Sable is sewing and when you set a clothing pattern as your inventory background. (And even with that, the colors are subdued and you have to find the edges yourself.) I guess they must have drawn those sprites pixel by pixel. 😮 And that is fascinating! haha, you read my mind! I’m trying to do the same thing for my guides section, but obviously their way is superior (a sample of mine, you can even see a a few pixels from the staircase :lol:). I’m thrilled to see there’s a texture for the candy wallpaper I have because I was planning on making a path based off of it. 😀 You’re good at finding these. ^_^ If only I knew how to make them myself. 😛 There was a tutorial in the first thread, but the links are broken for me. :O Awesome! I just saw your lovely background! It’s amazing! Fall colors! Nice Trees! Falling Leaves! Everything’s all themed up with Autumn! I love it! Compliments to Amy! That part about Curly was weird… you never even talked to him and then he just gives his picture!? Maybe he likes you…or have u been sending letters instead…? Nope, no errands or letters. 😛 The only times I talk to him are when he runs up to me with the “ding” noise and an exclamation point above his head. I guess I got into the habit of always talking to neighbors when they do that because there’s always a possibility (even a small one, if your friendship with them isn’t very high) of them giving you their picture. I already posted the story I announced in some post (I can not remember which one 😳 ) Oh and I loooove so much your new background!!! It’s amazing! Yeah, I know her town a bit better too! I recognize a lot of spots from pictures in her blog, but it helps a lot to be able to explore it yourself and see where certain locations are. 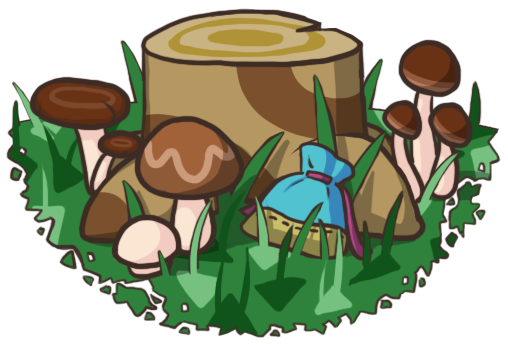 It’s very beautiful with lots of well-placed trees and flowers! “new leaf-strewn path”. Was that a pun or was that not a pun?